I’ve been working in this industry for many years. When I was starting, the reality was quite different than now. Back then it was more complicated - the number of tutorials and manuals on the internet was pretty limited. I didn’t have any social media groups and forums to ask around. I needed to learn everything by trial and error wasting a lots of time. Sometimes I just wanted to quit. Times have changed. Now the knowledge is at my fingertips. And it is way easier to start designing. At first, I'll try to explain which actions you should take to make your start easier. Also, I prepared a short interview with my friend - Arek. He recently started his career in UX/UI industry, so I think that will be helpful. I want to work in the UX/UI industry - how to do that? I would like to say, almost immediately, that’s simple! But my point of view is a bit skewed because I’ve been doing that for years now. So is it hard then? It all depends on your starting point. You need to face the fact that not everyone is born to do it though. Let’s assume that you’ve got some natural abilities to be a designer. What steps should you take to be a pro. Where to begin? To be honest - it will be most difficult for those without any experience at all. That’s obvious but I’d like to make you aware of the challenges you’ll have to take on. If you want to be a UI/UX designer, you’ll have to learn a range of skills. Using graphic design software would be the easiest thing to master. Why? Because if you lack the knowledge of design principles you won’t make it right. First things first check out this list of the websites that could be a good start. Made my first steps - what’s next? So now you know what is what and you are at the point when you can test your skills in the field. Start looking for an internship or even a junior job. This will give you a chance to perform in a creative environment or find a mentor who can guide you. Working in a team comes handy when you run into some obstacles. Never cease to ask questions. To find an intern or junior job in this industry, you’ll need to have a portfolio. It’s more important than your CV or qualifications. The portfolio should speak for itself. It would be perfect to include web, RWD and mobile projects. 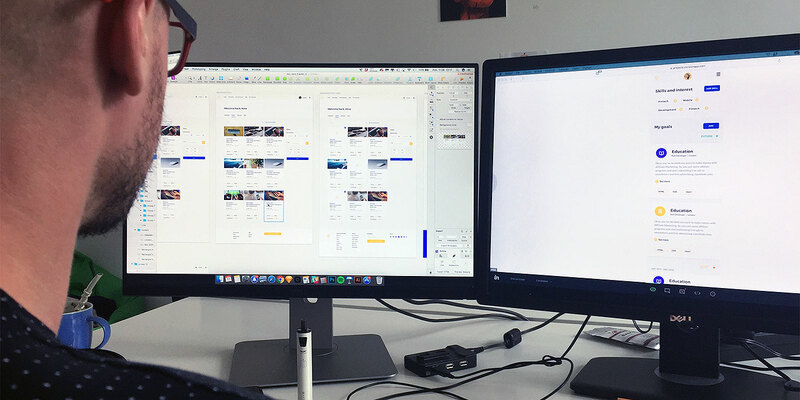 It would be even better to have complete projects rather than single screens. It shows that you understand the whole process of designing, the logic behind the product and its usability. Once you’ve gathered a nice and diverse portfolio, you can start looking for a company with an opening. Go to social media groups and browse through the ads there. You could apply to those companies who are not in search of designers at the moment, but may come back to you in some time. To spark your motivation, I decided to ask my friend a few questions. Arek has recently started his UI/UX career. Please note that, before that, he had some designing experience but for print only. I guess it was 2014 when I started doing it for real, but I came across Photoshop when I was a teenager. I learned it myself as most people do. I used Photoshop for everything from web to print. How did you start then? I was playing around with colors and icons in free templates. It was quite intuitive for me. Why did you change from print to digital? It’s all about fun… And you know - money. Right now as a junior in digital I don’t get as much as I had for the print jobs. You should know that for my position in DTP I worked for 4 years, and I’ve been in digital for 3 months now. How would you compare DTP to digital designing? There are plenty of differences such as the approach to information architecture. In simple words, in DTP you have to fill in every inch of available space, while in digital, usability and findability are more important. Honestly, in DTP I was a senior with a senior salary, and right now I’m a junior with a junior salary. But in the nearest future I expect that I will earn more than I used to. I’m Arek and I’m 27 years old. I’m a self taught designer specializing in DTP and brand design, but now the priority for me is the UX/UI design and I’m trying to do it best. I’m also a trainer and a retiring Brasilian Jiu Jitsu competitor. Let me introduce you to a new technology - WebUSB. Surely it will give a new impulse to the market of web applications. It will decrease usage of native apps when USB connection is required. Excited? Read this article.